Here are some descriptions of the books. *Images are from Amazon and I have also provided links to Amazon for your convenience! If you were a Plus Sign and If you were a Minus Sign are great to use when teaching equations. They both are cute stories that explain what you would do if you were a plus sign or a minus sign. I love If you were a Minus Sign because we do subtraction bowling and this book talks about bowling. The Shape of Things is a great book to use when teaching about shapes. Students will see different pictures and the shapes that make up that picture. I like to use Monster Musical Chairs when teaching subtraction. The monsters are playing musical chairs so a monster is subtracted away each time. Just Enough Carrots is one of my favorites to use for comparing amounts. Little Rabbit and his mother are shopping in the grocery store for food and compare the different amounts. The kids always love the page about buying worms! ICK! Pete the Cat and His Four Groovy Buttons - I probably don't need to say much about this book because it's PETE THE CAT!!!! My students LOVE Pete the Cat!! If you aren't familiar with this book it is great for subtraction because Pete loses a button one by one throughout the story. A favorite of my students for sure! 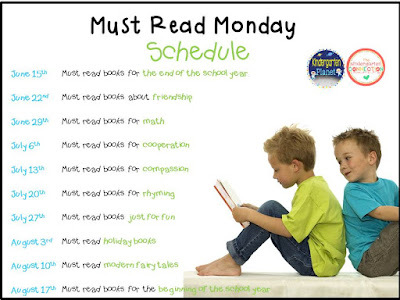 The Twelve Days of Kindergarten is great to read for a counting book at the beginning of the year. You can probably tell by the title that it is set up like "The Twelve Days of Christmas." Get your singing voice ready! 100th Day Worries is one of my favorite books to read on the 100th Day of School. Jessica worries about everything and when her teacher tells the class they will be bringing in a collection of 100 objects for the 100th day of school she of course worries! Will Jessica find a collection of 100 objects to bring in?!?! Domino Addition is a great book to use when teaching addition. I love using dominoes to help my students learn addition. You can grab a domino freebie in one of my previous blog posts by clicking here. 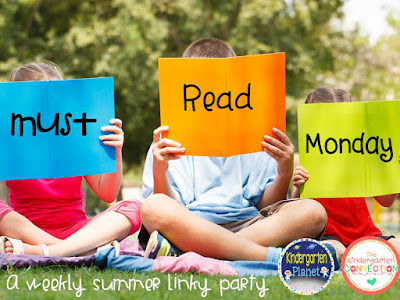 I can't wait to check out the books that everyone in the linky party shared!! What are some of your favorite books to use when teaching math?